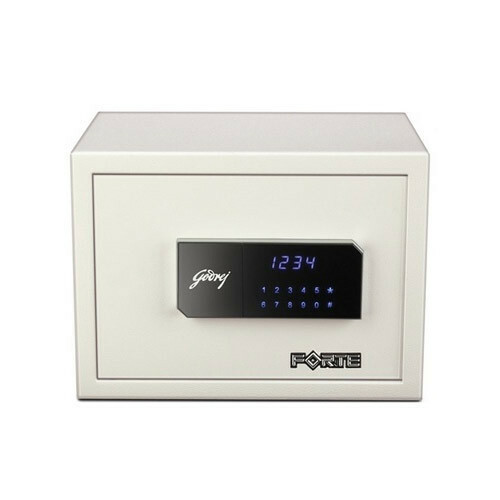 Forte Designed to compliment your beautiful interior, the safe also comes with a touch panel to make ultramodern security more convenient. The safe, equipped with motorised shooting bolts for added protection, comes with a sleek LCD display. A mechanical override option too is available in case the password is forgotten. The safe also comes with an emergency direct current electrical source. Features Led touch-panel Motorised shooting bolts Non volatile memoryNon volatile memory prevents password erasure, when the battery is low Mechanical override Mechanical override in case password is forgotten Auto freeze Auto freeze after consecutive wrong attempts Opens with a 3-6 digit secret password Low battery indicator Password entry can be hidden Digital locking mechanism USB data retrieval* Enabled with a master password.